Royal Ulster Agricultural Society (RUAS) boss Alan Crowe has said the body is eager to increase its footprint at the Maze. Joining Ulster Bank to launch this year’s Balmoral Show, the chief executive said the event, which runs from May 15 to May 18 at Balmoral Park outside Lisburn, would be more important than ever in light of Brexit. Mr Crowe, who took over at the RUAS last year, also revealed the organisation was in talks with the Maze Long Kesh Development Corporation (MLKDC) over extending its reach on the land. The RUAS is currently a tenant on the land, which is managed by MLKDC. Mr Crowe said: “We have a footprint of 55 acres at Maze with a further option of 10 acres, but we would like to take that up to 100 acres and are in negotiations with MLKDC. Nigel Walsh, director of corporate and commercial banking at chief sponsor Ulster Bank, said: “The Balmoral Show encapsulates everything that is great about our local food and agriculture industries. “After 10 years as the show’s principal sponsor, we believe this partnership brings Ulster Bank even closer to our customers operating in these sectors and makes it easier for us to show how we can meet their needs. “Throughout the last decade, the show has significantly broadened its appeal without losing its roots in agriculture. The RUAS last year finished work on a second exhibition centre at Balmoral Park, Logan Hall. It is also currently working on a mechanised linkage tunnel which would connect Logan Hall with the site’s main exhibition centre, Eikon. 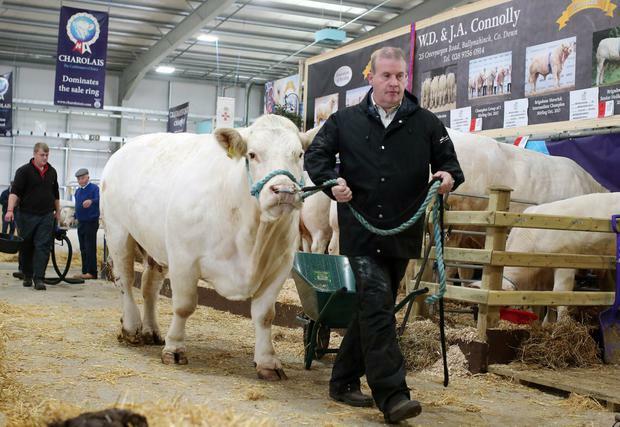 Mr Crowe said extending the space was necessary to ensure the future growth of the Balmoral Show and other RUAS events. “We are oversubscribed every year and have a waiting list of exhibitors,” he explained. He said he hoped this year’s event would match last year’s, which attracted 15,000 visitors. “We would like to expand the urban turnout and we have a new marketing campaign to deliver the message of agriculture to people who wouldn’t normally come to the show,” he said. He also said the “show must go on” regardless of Brexit. The event, regarded as “when the country comes to the city”, opens on Wednesday, May 15, just one week before the UK is scheduled to leave the EU, provided the Prime Minister’s withdrawal agreement is passed by the House of Commons. Theresa May, who visited the show two years ago, has indicated that she will step down if the deal is passed. Mr Crowe said: “Our role is not only to champion and promote agri-business, but it’s also an educational role. At the end of the day, farming is a staple part of the economy and we’ll need it, whatever way Brexit goes. “I am very optimistic about the future because there’s a resilience in the agriculture world, in Northern Ireland people and culture, and I’m very optimistic that we’ll expand and still do our bit to champion produce and agri-food. “The show goes on. It’s available for everyone. “It promotes everything that’s good across all cultures and creeds. It is our bread and butter industry.